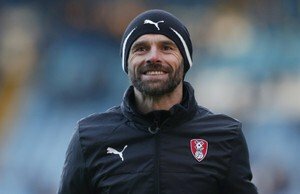 Rotherham United Manager Paul Warne said that although he thought the Millers had had more of the ball tonight than they had all season a draw was probably a fair result. I think that’s a fair assessment of the game. We were better the first half and City probably the better in the second half. Both teams had good chances to score and both sides defended well, with City’s ‘keeper, I would think, their man of the match. I wasn’t a neutral and I thought it was an exciting, end-to-end game and a great example for the Championship. As I said, we did have chances, again. Good chances. We work hard to get the ball, work hard to get balls into or around the box but then the finish still isn’t quite there. But, they say practice makes perfect and I do believe that is something we need to be concentrating on. Onto the trip to Birmingham on Saturday – and with all the injuries we’ve got then it could be the first eleven who turn up get a shirt!